"A moist lemon bread, good for afternoon tea." In a large bowl, cream shortening, 1 cup sugar, and eggs together until light and fluffy. Add milk alternately with flour mixture in two parts; mix well. Stir in grated lemon rind and nuts. Pour batter into greased and floured 9 x 5 inch loaf pan. Bake at 350 degrees F (175 degrees C) for 60 minutes. Allow bread to cool in the pan for 5 minutes. Mix together 1/2 cup sugar and the juice of one lemon to make a glaze. Remove bread from pan. Pour glaze over warm bread. This is great as a dessert! I usually use butter instead of shortening, a tablespoon of lemon zest and I make the glaze by combining lemon juice with powdered sugar. It is perfect with tea. I have discovered that it is quite difficult to find a good lemon loaf recipe. This one, however, is one of the best out there! The nuts are an interesting addition. 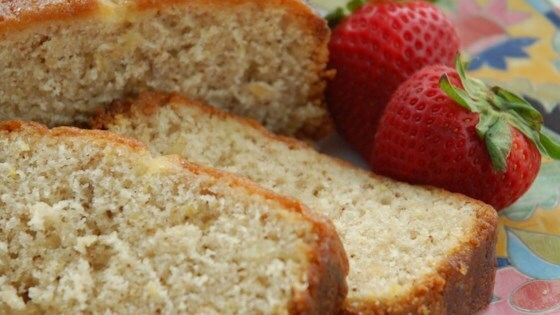 Produces wonderfully moist lemon bread! Increase the amount of lemon rind for a very tart treat!